Lea started complaining of a “collapsing leg” problem. At 35-years old, the dreaded degradation began. She would lose her strength and fall, she was breaking dishes, and worst of all, she was losing her self-confidence. I thought we were on track to buy our first wheelchair and that her days of nearly full independence were coming to an end. Lea has dragged her right leg since she first started walking, we bought new shoes often because the right shoe would wear a hole through the sole in no time. I chalked this up to her spina bifida and paraplegia. When she was six years old, I had learned she had a “tethered spinal cord” and that over time she could lose lower limb functionality. 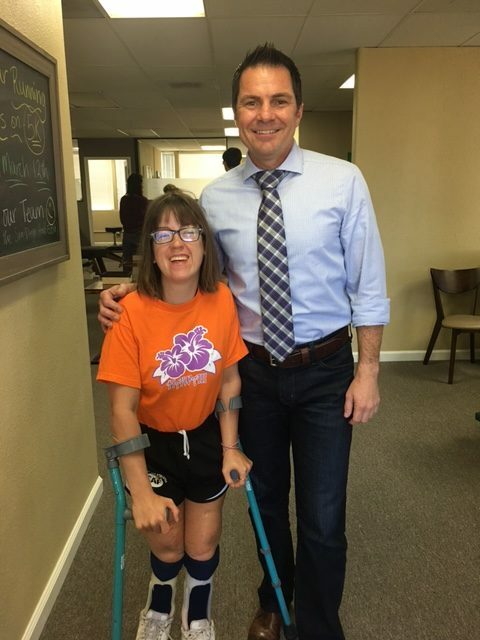 Chiropractic has been a part of our family’s health regimen for at least 25 years, so my instinct was to take Lea to our usual, wonderful chiropractor. The doctor was able to help Lea, but the adjustments didn’t hold for long and Lea’s collapsing leg problem was causing more distress by the week. I asked a friend for a recommendation and was directed to Drs. Tapia and Young and their NUCCA practice. Like other chiropractic, NUCCA focuses on proper spinal alignment, but it is different because the alignments focus on the first two vertebrae at the base of the skull. The theory is that if the vertebrae closest to the head are out of alignment, then the remaining bones and muscles will align to compensate. In Lea’s case, the compensation looked like a curved spine, tilted hips, and a right leg that was two inches longer than the left. After ten months of consistent treatment, Lea is now symmetrical! She has forgotten about her collapsing leg problem and has regained her confidence in her body when walking. She still drags her right foot, but symmetrically with her left foot … now her shoes wear evenly. Based on past experience, I can’t imagine that a traditional neurologist would have suggested a gentle, non-invasive chiropractic before suggesting surgery or non-action. I’m an engineer by education and trade, so I know that my story is not scientific proof of NUCCA’s efficacy; it is an anecdote. NUCCA has proven effective for Lea and our family. Guest Blogger Bio: Martha de Forest is a dual degree engineer and certified integrative hypnotherapist. She has been married for over 30 years and has raised two daughters, including Lea. Call our office at 619-313-5403 to schedule your first NUCCA appointment.